While the movement of yellow vests continues blocking actions and demonstrations since November 17, we saw how the main unions have shown solidarity and no solidarity with the movement according to some violent actions or according to what the government proposed. Anyway, the majority of yellow vests are not unionized and claim to be apolitical. However, many small local union groups wanted the convergence of the struggles and allied themselves with the yellow vests on several actions such as factory blockades, rallies in front of big names of the industry who, at the moment even are organizing plans for dismissal while their shareholders are getting more and more every year, and little by little handcrafted or professionally made, the names of some French unions appeared on some yellow vests. We had spoken in a previous text about the possible resentment of the unions against these groups of demonstrators who managed to mobilize hundreds of thousands of people for several weeks while the last calls of unions to demonstrate mobilized less and less. Still, two weeks ago, the Confederation Generale du Travail ( CGT) called for a big day of national strike on February 5th. Many yellow vests have joined this call, and posters, flyers and facebook event call for GENERAL STRIKE. However for non-unionized workers it can be dangerous and/or complicated to go on strike, specially in a time of economic crisis such as now. It remains therefore only speculations and wishes regarding the participation of the Frenchs for this general strike. 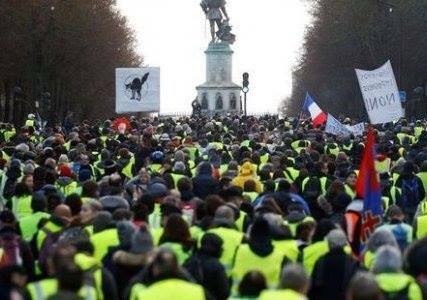 Saturday the 2nd of February, for the 12th Saturday in a row, the yellow vests were in the streets to ask for better life conditions et specifically for this last Saturday, were complaining against the police violences which have hurts hundreds since the beginning of the movement. On that day 123 000 were counted in the streets. How many will be walking on Tuesday… Let´s hope for millions. Previous Post:Support manifestation for detained and imprisoned comrades in S:t Petersburg and Penza!